Please be assured that all of our meals are made to order, peanut free and include only the best and freshest ingredients possible. Please state which location you would like to reserve in your email. We will gladly reply to your requests, however, we do hold the right not to accept reservations at certain times. Please take note that reservations of six or more will be held for 15 minutes, unless half your party has arrived. Should you be less than half of the number you have booked, after 15 minutes, you may be asked to give up some space to waiting guests. 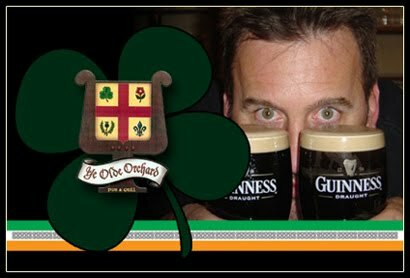 Ye Olde Orchard pub and grill is a friendly Celtic Pub that caters to customers looking for a cozy family atmosphere in the heart of the Monkland Village in N.D.G (5563 Monkland). Established in 1996, Ye Olde Orchard has become a thriving restaurant business, complimenting the surrounding residential and business communities. In 2005, a unique opportunity for expansion developed in the heart of downtown Montreal. The management team of Ye Olde Orchard recreated its Celtic style restaurant in the center of Montreal’s tourist and business community. Ye Olde Orchard mountain is on the first floor of a beautiful heritage building located at 1189 De la Montagne street between Rene Levesque and Ste-Catherine street. The establishment has a full bar license and over 3200 square feet of ground floor space to accommodate 200 patrons. And then there were three... On March 17th 2008, Ye Olde Orchard opened it's third location in the hippest part of town, the Plateau Mont-Royal. Located at 20 Prince Arthur west, just steps from St-Laurent blvd., the Plat-O has become a favorite amongst neighbourhood regulars, scenesters and sports enthusiasts.